The sun is shining and wanted to blog about a lipstick I bought yesterday and love it! I blogged about Nars Bolero Matte Lip pencil last week which is a stunning colour, I had a lovely response to the post one of which was by Anastasia. Anastasia mentioned that Natural Collection have a similar shade called Rose Petal, so of I went and I must say apart from them being totally different finishes I am impressed with the colour still. Plus the fact these lipsticks only cost £1.99 is amazing!!! The packaging isn't anything special but for £1.99 can you really complain? 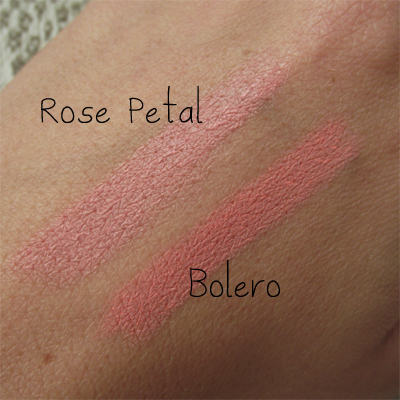 Here's for the swatches, as you can see Bolero for one is matte whilst Rose Petal has a sheen to it, Bolero is much more of a bolder shade but I have to say Rose Petal is still very pretty so I'm still happy. The texture on the lips is very nice and creamy and their is no scent overall I am very impressed for £1.99!! Have you tried Rose Petal? I'm now considering some other shades from the Natural Collection range.